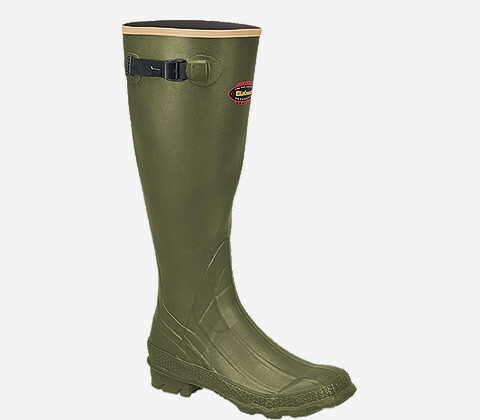 The Grange® rubber hunting boots are tough and economical with premium, ozone-resistant 100% waterproof rubber. The removable EVA footbed provides cushioning and the chevron-cleated outsole won’t track mud or dirt. The LaCrosse® Ankle-Fit™ design prevents slippage while walking and provides a secure fit. These are great all-around boots for hunting, farming, and other messy environments. Ozone-resistant, abrasion-resistant scent free rubber offers 100% waterproof protection. Our premium compound of rubber has a high tensile strength, which means greater tear-resistance and greater durability. Chevron cleated outsole is ideal for sloshing through mud and water. The large cleats shed mud and debris while giving you great grip and traction.